Listen to our safety tips! Swimming and other water sports are fun, popular and widely accessible recreational activities. Nonetheless, they carry risks for potentially serious and preventable traumatic injuries. Here are simple tips to avoid most of them. According to the Canadian Red Cross, drowning is a leading cause of death in children. In Canada, an estimated 60 children aged 14 and under drown every year, while another 140 are hospitalized for near drowning. The majority of these deaths occurs in home pools and is preventable. Knowledge of water safety is essential and life saving techniques is an asset. Surround home pools by four sided fencing (minimum of four feet or 1.2 metres high) with automatic locking gates. There should be NO direct access to the pool from the house or patio. Do not place chairs or tables near a pool fence, as they could enable a curious child to climb over. Completely remove pool covers before entering the water. Filtration systems should have proper coverings and be checked regularly. Pool maintenance should be done regularly. 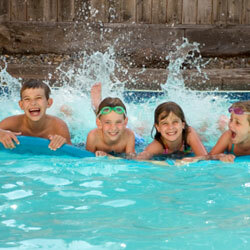 Store pool chemicals in a safe place out of the reach of young children. Make sure hot tubs have secure covers that children cannot open. Never leave an uncovered hot tub unattended. Rules should be clear and enforced: NO pushing, NO jumping on others, and NO running around the pool. Remember to tie up long hair or wear a bathing cap to avoid getting it caught in drains. Surround inflatable pools by a fence. Empty kiddie pools when not in use. Always have an emergency life buoy, first-aid kit and cordless phone close by. To view the Quebec government’s official document on residential pool safety regulations click here. Ensure your child has adult supervision at all times when around the pool. Young children should wear properly fitted personal floatation devices. This also applies to older children who are non-swimmers. Floatation devices should never be used as a substitute for adult supervision. Make sure children swim in an area for which they have the appropriate skill level. Children and teens should be encouraged to take swimming lessons. Montreal coroner, Jacques Ramsay suggested in his report of August 15, 2008, mandatory swimming lessons for children between the ages of 5 and12 years old. Never dive into lakes or areas with shallow water. A minimum of about 3 metre-deep water is recommended. The 3-metre diving board should only be used after proper instruction and with trained supervision present. It is not a toy. Backyard trampolines are not recommended and should never be used as a launch pad into a pool. Water park equipment should be routinely inspected. Trained staff on site is essential. Supervision needs to be very attentive as injuries can happen fast. Remind users to clear the bottom of water slides quickly. Limit the number of people using the equipment at the same time. Equipment should be appropriate for a child’s age, height, and stage of development. Everyone must wear properly-fitted life jackets (regardless of swimming ability) that meet approved safety standards. Check weather conditions ahead of time. Being on a lake in stormy weather is not advisable. Ensure the boat is well maintained and has emergency equipment. Never overload or stand in a boat. Children should not go in a boat alone. Skilled supervision is essential. Only get out of the boat once it is docked. Frequently apply waterproof sunscreen with at least SPF 30. Wear a sun hat to help prevent sunstroke. Drink water before, during and after activities and especially while playing sports. Choose a pair of sunglasses with UVA and UVB protection and avoid looking directly at the sun and its reflection off of the water. For more details about sun protection, click sunburn (link: injury prevention/weather risks). Note: Alcohol consumption while taking part in water activities is not recommended. Stay alert!